"Knock, knock, Neo." The Coolest App I ever wrote! This is so cool I can't even come up with a name for it. So, name it what you want. I my gift to you. Instead of installing some other app that just output some unreadable stuff, use my script. Or you can run it on one of your work space by itself. Have the terminal in fullscreen, your cli font set to Courier 10 Pitch Bold, with dark background and Matrix like green foreground (text). And let it do its Matrix thing without touching it. Let your friends and strangers be amaze. Im sorry, im newbie on that kind of stuff, can you help me to make a succeful "install" of that desktop? man...how do i copy it without the need to re-type all the "new lines" lol...is it bad formatted? Hi, what theme are you using? I have the cyan theme and my windows still dont look like yours. The top bar on top of the window itself that contains the name of the program, minimize, maximize and X button still look normal which ruins it. I use openbox, conky, and gnome-terminal. 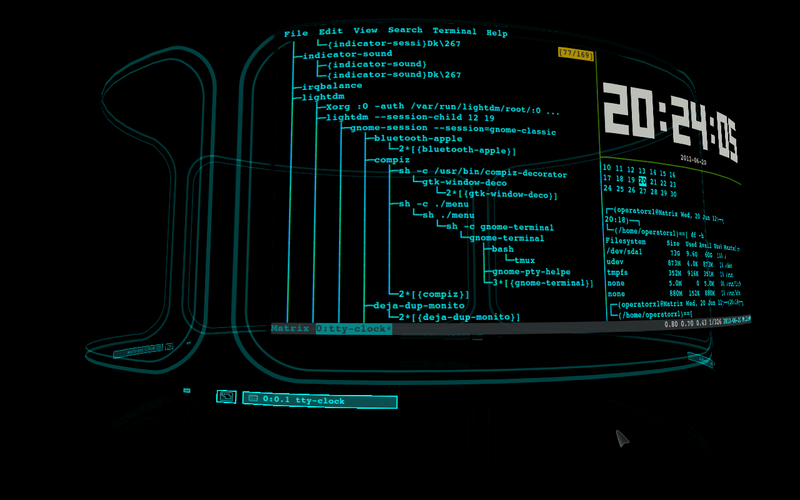 I know Compiz does the effects, I just want the black and rounded edge Tron theme. I read your tutorial but im not seeing tutorial on where you started first with your theme. Hello Salem, I rewrote your script in perl. Added a few things: prints out some text one char at a time; like someone is typing it, control of how fast the lines print for a cat, some randomly generated output to make it look like the script is doing something important, and a couple of other special effects. It's starting to look good. Would you care to share the wallpaper?